Day 2…one more…believe it or not…after I write this post I have to finish my shopping! I use the the #22 and #24 size needles too and they give the perfect end product to one’s quilting project! Janet…please email us your address to:primitivegatheringsquiltshop@yahoo.com and we will get your prize out to you….needles and some fabric! That’s one of my favorite methods too. Your party looked like a blast–Merry Christmas! This tool looks wonderful! I’ve always had problems with my geese. This looks like a very easy way to make geese. Have a very Merry Christmas! This is also the way I make my flying geese. It’s nice that the measurements for the fabric requirements are all together. Hope you get your shopping done!!! This is a great tool, it has saved me! A girl can never have too many tools…quilting/sewing tools that is. Great reference tool! I am ordering this! happy last minute shopping! I am glad for now that the only snowflakes I see are coming across this page! No waste flying geese … great technique! What a great tool & yardage chart! Now the birds can all fly in formation! Will have to try this as mine typically veer west or east or have lost their nice pointy “beaks.” Shopping , wow, good luck!! This looks like a great tool. My flying geese never seem to fly as they should. Merry Christmas! I have the quick quarter ruler and it is great. I think I need this tool and reference sheet. Thanks. I have made my geese that way and you’re right-it is easy! The chart looks like a good thing to have also. I’m also STILL shopping !!!! Yikes…..good luck with your shopping……this looks like the perfect solution to my flying geese problems. Merry Christmas to you and yours and thanks for your great blog suggestions. Oh you’re reminding me that I want to make a quilt in 2014 with a gaggle of geese. And making 4 geese at a time is just perfect. Happy Holidays! I haven’t used this method yet. looks great. I need to try the quick quarter. Looks like a helpful tool. Wow something else I need. The tool looks very helpful. Can’t wait to try it. Perfect tool for me. I am enlarging a BOM by adding a flying geese border…it would make it “sew” much easier. I have tried this method for making flying geese and it is awesome. I definitely need this. I have always had a love/hate relationship with flying geese! This would make it so much easier. Thank you for all your tips. I love the 12 days of Christmas! I want Santa to bring me all these gifts! What a great tool for making flying geese! Great way to do flying geese! What a neat way to make flying geese. Your instructions look easy to follow too. Looks like a useful tool. Flying geese give me trouble. What a great reference tool to have! Merry Christmas!!! I have so enjoyed learning about the notions that make quilting easier. I have a lovely package of goodies ordered to help me get a good start on my projects in the New Year. Wow!! This tool looks fantastic…if I don’t win one, I might have to buy one!! Thanks for the chance! Looks like a good way to make flying geese…thanks for another great post!! Good luck with your shopping!! I am going to be said to see these posts come to an end. Maybe there can be a once a month new item or favorite item. I have so enjoyed this, even the items that I’m familiar with. Thanks and enjoy your shopping. Looks like another wonderful gadget. I am in need of flying geese help. I think this would definitely be the right needful thing for me! Nothing better than making flying geese easy!! Great tool! Thanks for sharing! Hmmmm….I’m curious about this! I would love to try it! Thanks Lisa! I love your 12 days this year and last! I’ve used this method before but only when the pattern called for it. I would use it more often if I had the chart — I don’t want to do the math. I’ll order this one! Great tool! I love making flying geese this way. I definitely need this. I am currently obsessed with Flying Geese. Thanks for another chance to win! This is going in my cart, just in case. Another great thing to add to my tool box! I have had this tool for some time. It really comes in handy. Good luck shopping!!!!! 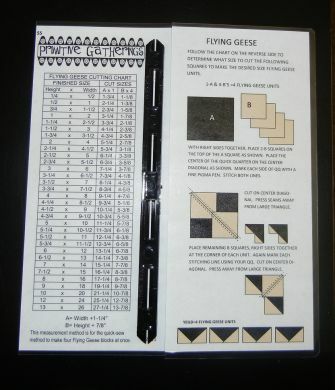 Just ordered the quick quarter tool and flying geese chart. Your tool looks better than the one I use, so I think it will help me get my flying geese finished perfectly. Thank you for all you do to make our quilting lives simpler! Simple, easy way to make flying geese! Thank You! That’s a great way to make flying geese. Thanks for doing all the math for us! I have this tool and I love it! What a handy tool, and something I need. Thanks ! Anything to make it easier sounds good to me. Thanks for all you do. I do not have this but it looks wonderful and helpful. Have a Merry Christmas!! Merry Christmas! This looks like another thing I NEED…… I just placed my order, I can’t wait for all of my goodies to arrive!! Thank you for all of the great suggestions. Looks like a cool tool. Hope you had a successful shopping trip. I just finished making my 3rd and last wool stocking from the Primitive Christmas pattern. So happy to have them done in time. Have a wonderful Christmas. Looks like something I could definitely use, so I ordered one for me and a couple of others for gifts. Thank you I have been enjoying being inroduced to new products I have not seen. Another useful product. Happy Holidays! Such cool shortcuts for complicated but pretty blocks. Still not my favorite, so this tool looks necessesary! I haven’t tried flying geese. Sounds like this tool would make it easy for beginners like me. Thanks for the great info! I think this is a great tool-quick and fool-proof with the the chart and guide-wish I could’ve been at the party! This is a great method for making flying geese. I have not tried this method for flying geese. Very clever! I look forward to trying it. Wow – that looks like such an easy way to make flying geese. Quick quarter is amazing. Love the fast way to make flying geese!!! I have used this tool and use this method, the no-waste method for making my flying geese. Your chart will make it all very handy. Very interesting tool….looks like an easy way to make flying geese! Thank you for sharing! I would love anythng helping me to do more accurate flying geese! This tool is indeed an eedful thing for quilters, a must have. That looks like a great tool! I would love to get one! Hope your shopping goes well! I haven´t used that tool and use this method to make geese and anything to help to go quick is fantastic.This tool is a fabulous helper.Merry Chriatmas and have a great Christmas Eve! I make my flying geese using this method and it would be so great to have a cutting chart and the quick quarter to use, Each time I do flying geese I have to calculate what size I need to cut. Merry Christmas!!!! Any help i can get in accuracy would be appreciated. This sounds like a definite needful thing for someone who loves Fluing Geese! Back to wrapping! Merry Christmas! I definitely can use this – hope this is my lucky day – course, tomorrow I will be placing my order the goodies you have recommended. Thank you for all the sale items. You have come up,with some terrific tools to show us this year. The chart looks very efficient. Thank you for the chance to win and happy Holidays to you. Another wonderful tip. I just ordered this tool, among other things so I am looking forward to another Christmas when these all arrive. Many thanks – Merry Christmas and Happy shopping! Sounds like you are feeling much better than you did a week ago. What a great needful thing. That looks like a great way to make flying geese. Merry Christmas! I love this method of flying geese. Looks like a great tool, making quilting easier for us all! Any tool to help make flying geese quicker and easier sounds good to me. This is a great tool. Thanks for all of the tools that you have been showing us. Merry Christmas. This tool makes marking so easy. So disappointed that this tool is out of stock…we were out of state and without our computer so I couldn’t get my order to you before they were sold out…will you ever have them again….I SOOOOO WOULD LIKE ONE!!!!! I use flying geese in so many of my quilts.